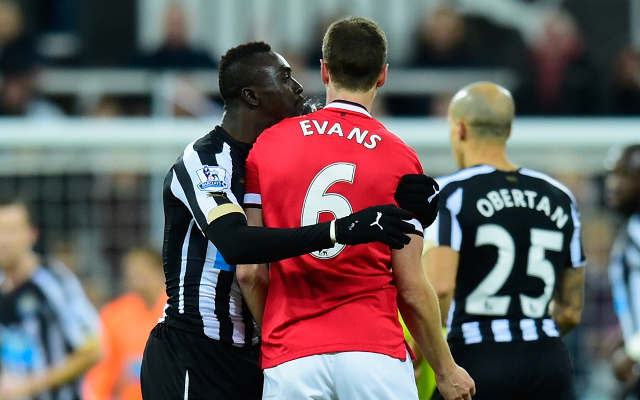 Man Utd’s Evans & Newcastle’s Cisse Face SIX Game Ban After Spitting Row! 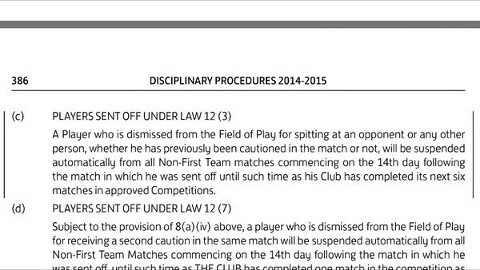 By the letter of the law, the pair should face a ban of six games. Manchester United defender Jonny Evans and Newcastle United striker Papiss Cisse were involved in a disgusting spitting row during their Premier League clash on Wednesday night. Damning footage shows both players spitting at one another – with Cisse childishly responding to Evans’ initial outburst by copying the defender’s behaviour. The incident could now land the pair in hot water with the FA; the Disciplinary Procedures notes that, A Player who is dismissed from the Field of Play for spitting at an opponent or any other person, whether has previously been cautioned in the match or not, will be suspended automatically from all Non-First Team matches commencing on the 14th day following the match in which he was sent off until such time as his Club has completed its next six matches in approved Competitions. Referee Anthony Taylor spoke to both players, but neither were shown a yellow card for the encounter – however if the FA opt for retrospective punishment – the pair would be banned for the next six matches, as stated in the discipline handbook.